Valentin Serov was an extraordinarily gifted artist. He painted amazing portraits, he wonderfully managed landscapes, animals, flowers – everything that gave rise to inspiration in him, found a bright reflection in his canvases. As a subtle landscape painter, Serov could not be indifferent to the beauty of flowers. His painting “Flowers” was a real gift for fans of his work. One of the favorite periods of the artist, was the time when the lilac blossomed. Heavy clusters are dissolved in late spring, when there are no cold winter echoes, when the whole earth wakes up from heat and sun caress, when the soul stops in anticipation of incomprehensible happiness. In the rainbow waves of small flowers, houses sink to the very rooftops, hiding both wealth and poverty. Generous, calm beauty fills the whole space, and it’s bitter to think that a little bit of time will pass, and this riot of colors will fall. I want to breathe, see a lot, keep this vision. 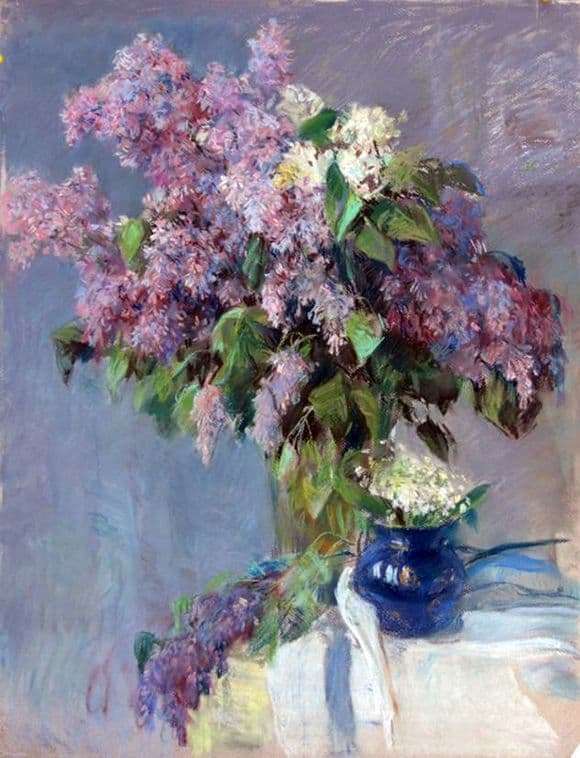 Serov was very fond of lilac, he managed to preserve this magnificence for us. These fragrant branches are often present in his paintings. And here in the center of the picture is a lush lilac bouquet. All the magnificence of modest colors tried to show Serov in this picture. White and lilac brushes are not just table decorations, they are much more. Lilac lives for so long with a person that for every contemplator of a painting a bouquet necessarily causes waves of surging memories. Maybe this is a cheerful childhood, and, perhaps, carefree, distant youth. Lilacs are warm summer evenings, this is the first longing, this is light sadness, these are hopes. The picture is written in cold, blue – lilac tones, however, the feeling of gloom does not arise at all. White highlights of light brushes, warm strokes of small colors fill the entire canvas with lightness, purity and light. There is a feeling of the coming morning, morning of the day or a new life.